Comparing yourself to what you did 2,3, or 10 years keeps you trapped in the past. It can prevent you from taking risks (so you feel safe) and keep you chained to average or poor past performance. But what if you were doing really well 2 years ago? Comparing yourself to that point in time only tells you what you were capable of back then. It doesn’t help you achieve your optimal level of excellence today. Your customers don’t care what you did for them 2 years, 6 months, or 6 days ago, they care what you do for them today. Besides you can not assume that your competition has stayed the same or that the market hasn’t changed. That would be an even bigger mistake. Achieving excellence means you continuously push yourself beyond where you feel comfortable and into new territory. Sometimes that means striving for a goal that scares the hell out’ve you because you’re not sure you can hit it! It means that you embrace change, fear, and new ideas. Notice I didn’t say ACCEPT change, fear, and new ideas … I said EMBRACE … their is a big difference. Remember, excellence is not a place you arrive. If it was, you wouldn’t be there very long because as soon as you stop striving for excellence … you lose it! Excellence is a state of mind (belief) that needs to permeate every crevice of your business and your life. It takes less than a nanosecond to decide to “be” excellent (Step 1). Once you decide, start acting with excellence in everything that you do (Step 2). 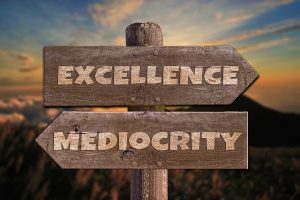 Excellence or mediocrity, you always have a choice … choose wisely!